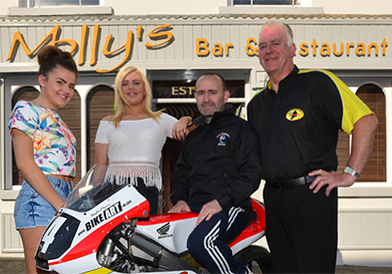 THE Armoy Road Racing Club are delighted to have returning sponsor Sammy and Shelley Mullan, of Molly’s Bar and Restaurant for the Moto3 GP 125cc Race. Sammy Mullan, having lived in the area all of his life is a great supporter of the Armoy Road Races and has been since its inception, sponsoring several different races over the first few years. Sammy said, “Road Racing is pretty much part and parcel of life in this town. Every week, if not most days, a fan of road racing is travelling through – whether they are just popping in for a drink or staying a little longer and having something to eat. “I’ve been in business for over twelve years on Ballymoney’s main street and coming from the town, I remember how Joey [Dunlop] and Robert [Dunlop] made the 125cc motorbike racing famous. There are a lot of 125cc riders in this area and I and Molly’s Bar and Restaurant, named after my daughter, Molly, are only too delighted to be able to support the Armoy Road Races by sponsoring this race again in 2017.